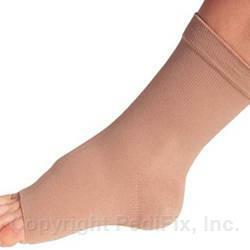 Unique, high-quality, German-made compression sleeve helps minimize foot and ankle swelling. Speeds healing after ankle or foot sprains, strains, or surgery. Graduated compression from metatarsal heads to the lower calf to improve venous activity. Lightweight, hypoallergenic elastic stretches comfortably for optimal fit. Special fabric and sewing technology is cool and comfortable, with exclusive ankle-heel hugging knit design. Fits in most shoes. Sizing based on Ankle Circumference, measure right above ankle bone.